It has been reported that the whole area of Rebgong is under military siege as large of numbers of Chinese military personnel encircle the region from the surrounding hills. An unprecedented large number of Chinese troops have been deployed in Rebgong (Chinese:Tongren) in Malho Tibet Autonomous Prefecture in Qinghai Province, while the authorities put a ban on selling mobile SIM cards in an attempt to restrict flow of information to the outside world, a source told TibetNet citing eye witness accounts. The Chinese government reinforced massive troops deployment in the days leading up to the 50th anniversary of the Tibetan uprising against the repression by the People's Republic of China. According to the source, the whole area (Rebgong) is under military siege as large of number of Chinese military personnel encircle the region from the surrounding hills. The eye witness said such military build-up in the region is far greater than what it was in 1958, a year before the China's invasion of Tibet. Fearing that the information might leaked to the outside world, officials of the Public Security Bureau barred a group of foreign journalists from visiting Rebgong. The normal religious activities in Rongpo Monastery have been seriously disrupted, the source added. Many Tibetan youths are expressing strong resentment over the Chinese government's confrontational tactic of troops deployment without any provocation from Tibetans, the source said. But they followed the advice of His Holiness the Dalai Lama and exercised utmost patience not to give in to these provocations, the source added. Contrary to the reality, China's Prime Minister Wen Jiabao said today [14 March 2009] on the side lines of the annual National People's Congress that the situation in Tibet is peaceful and stable. More than 220 Tibetans have been killed and 1,294 injured in the Chinese government’s ruthless crackdown on Tibetan protesters across Tibet since 10 March last year . More than 5,600 people are still under arrest or detention and more than 1,000 are reportedly missing. Strengthening repression on the fiftieth anniversary of the Tibetan national uprising day on 10 March , large number of armed security forces were stationed in the streets, intersections and public places in the capital Lhasa. On the same day in Karze Tibet Autonomous Prefecture, normal life was thrown out of gear as authorities ordered every single shops and restaurants to remain closed. Restrictions were imposed on private taxis and Tibetans from travelling to Tibetan inhabited areas. Similarly, massive armed forces were also deployed across Tibet, causing great repression and disturbances to the Tibetan people. The situation remains unchanged till date, according to sources. Protests against the Chinese authorities were also witnessed in Lithang County on 10 March , as the region was locked down under heavy military presence estimated to be more than 20,000. An unidentified Tibetan monk shouted slogans at around 11 a.m. (local time). When armed security forces tried to apprehend him, commotion ensued as a group of people took on security personnel to rescue the monk. The fate of the monk still remains unknown. Later in the afternoon, a monk from Bathang, Lobsang Wanchuk, aged 29, raised slogans and was immediately arrested. Both the monks are believed to be from Lithang Monastery, but the sources could not give their details. The sources said people seldom go out of their home and the whole market area looked deserted since 10 March . Even if they tried to travel, they have to face great inconvenience from the security forces. On 6 March  in Kyekundo district in eastern Tibet, two young monks shouted slogans and distributed leaflets. The monks managed to escape detention, sources said. 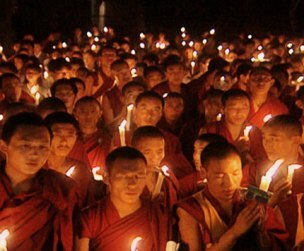 But on 8 March , four other men were detained for collecting the protest papers spread by the two monks. The police have begun searching operation to arrest the two monks. Tapey, the monk from Kirti monastery in Ngaba, who set himself on fire in protest and later reportedly shot by Chinese security men on 27 February , has been asked to amputate his leg and arm. The doctors said the amputation will keep his life out of danger. He is currently undergoing treatment at a hospital in Chengdu. According to sources, the Chinese authorities are attempting to destroy evidence of Chinese authorities' brutality and indiscriminate firing at Tapey. Earlier, the Chinese state media reported minor burn injuries on Tapey's head and neck. To conceal the brutal shootings by officers of Public Security Bureau, the state media quoted a monk from Kirti monastery, Jangkor, admitting that the shooting incident was fabricated.